Peek into the Learning Assistance Center on the Portsmouth Campus. If he’s not teaching class, it’s a good bet the Tidewater Community College mathematics professor is inside, explaining equations or deciphering calculus for a student in need. He speaks with an enchanting accent stemming from his native country, Ghana, a place where walking barefoot to school while carrying a table above your head is commonplace. “It’s the same table you have to remember to bring home, or you’ll have nothing to eat and drink on,” he says. Agbakpe didn’t embrace academics instantly. He had nine siblings, and his younger brother, Patrick, eventually caught up with him in class after skipping grades. He took a week to visit his brother, studying business administration in college. He watched Patrick’s study habits, realizing how much he was rewriting his notes. Agbakpe received his bachelor’s from Ghana’s University of Science and Technology in 1989. He has a pair of master’s degrees from Hampton University, where he also received his doctorate in nuclear high-energy physics. After teaching 17 years at Norfolk State University and spending 10 years as a senior associate fellow at Jefferson Lab, Agbakpe came to TCC in 2011. He continues to be a visiting professor at the University of Virginia during the summer. 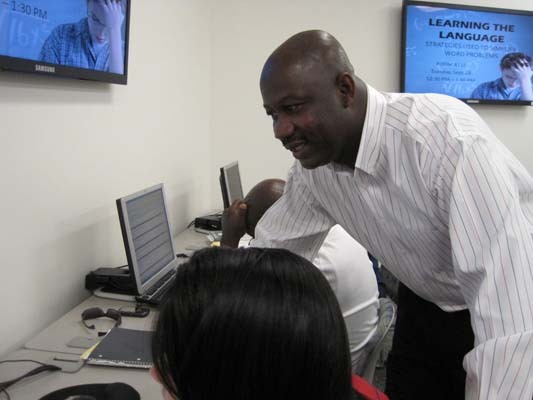 Agbakpe came to TCC largely in hopes of steering students toward careers in math and science. His challenge involves breaking the mindset that math and science are daunting subjects. Students often take the minimum requirements. He shrugs at the notion.